Learn the science behind Star Wars with Uncle Milton's educational toys and gadgets. 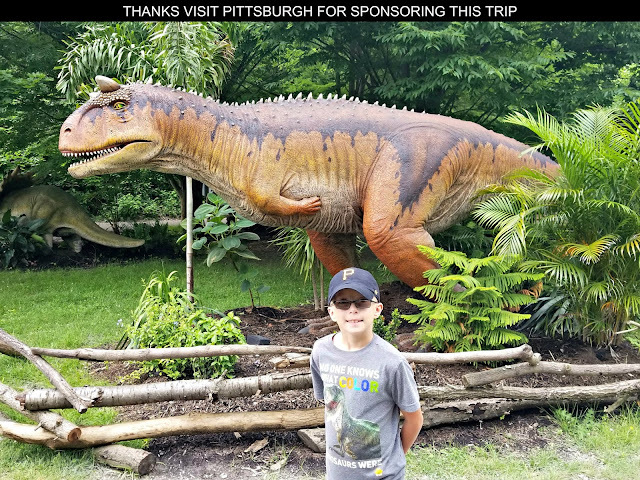 Uncle Milton is one of our family's favorite brands because it does a great job of introducing children to scientific concepts in a fun and entertaining way. The originators of the toy industry icon, the Ant Farm, since 1946 Uncle Milton has created toys that inspire imagination and learning while encouraging kids to explore the world around them. 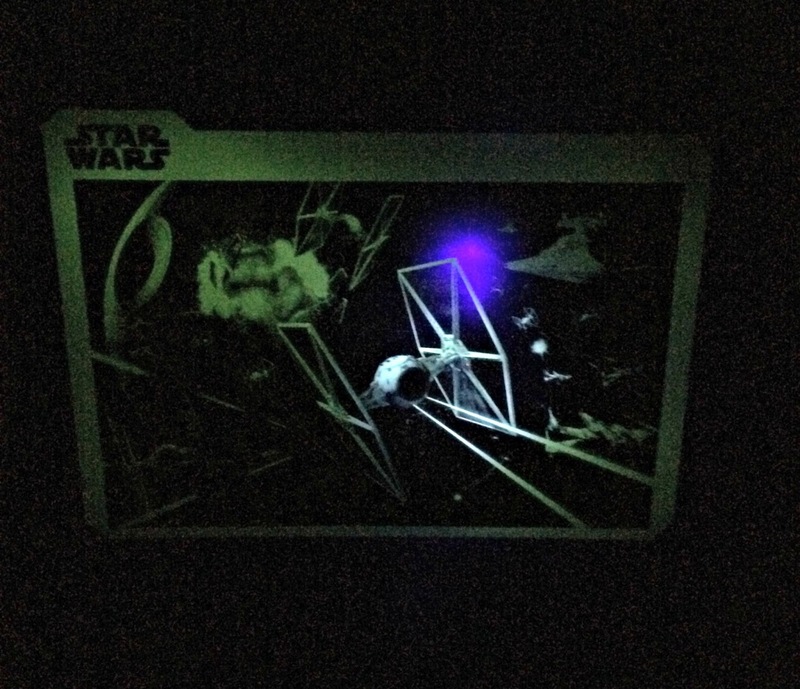 We recently tried out the Millennium Falcon UV Light Laser kit from Uncle Milton's Star Wars Science line of products. Recreate a Star Wars space battle on the wall of a room with ultraviolet light and a pinpoint laser. 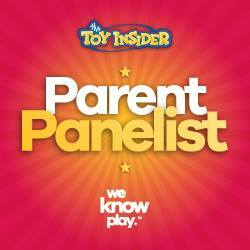 A Geek Daddy has to say this product is pretty darn cool! To create your battle scene first peel and attach the included UV screen onto a wall. It is about the size of a standard 3-tab file folder. Next take the provided battle scene film and gently brush it across the UV screen with your fingers so that it clings to it. The Millennium Falcon laser light device has two functions. A lower button on its trigger releases broad UV light and pressing the upper button shoots out a laser beam. Illuminate and charge the scene by pressing the lower button and moving the light all around the scene. Quickly peel away the film from the UV screen to reveal a glow-in-the dark Star Wars battle scene. Aim and press the upper button on the Millennium Falcon laser light device to shoot pinpoint blasts at the glowing ships pretending you are Han Solo and Chewbacca flying into battle versus the evil Empire. See how many TIE fighters you can hit with your laser before the scene fades away. 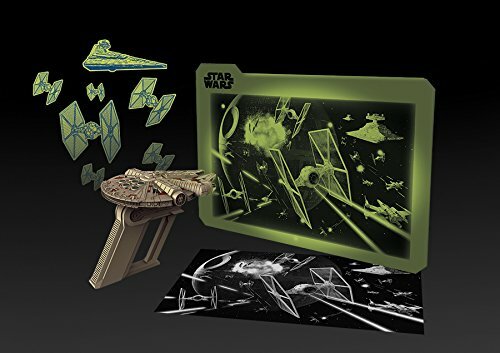 The Millennium Falcon makes laser blaster sound effects to enhance imaginative play plus the kit comes with glow-in-the-dark stickers so children can customize the experience beyond the the Star Wars space scene cling. Then recharge the scene again with your UV light and start the fun all over again. In addition to the space battle game, you can also have a lot of fun creating drawings on the UV screen. Instead of using the Star Wars battle scene cling be creative and make your own designs on the UV screen. Place your hand or different objects in front of the blank UV screen and illuminate them with the light function on your Millennium Falcon to create different glow-in-the-dark shapes. Then use the pinpoint laser to draw additional details onto your image. Have a blast making all sorts of glow-in-the-dark artwork. A science learning poster packaged with the toy set provides children with information about lasers, ultraviolet light, and phosphorescence. Then kids learn about how these topics that they are probably familiar with through Star Wars work in real life by enjoying themselves with the Uncle Milton Millennium Falcon UV Laser Light which combines phosphorescence, UV light, and lasers to make the toy set work. Uncle Milton's Millennium Falcon UV Laser Light gets A Geek Daddy nod of approval for being an entertaining toy my kids really enjoyed that also did an excellent job of educating them on scientific principals. This is an item we've stored on our game shelf so that we can use it over and over again. For more information on the Star Wars Science products from Uncle Milton visit unclemilton.com.